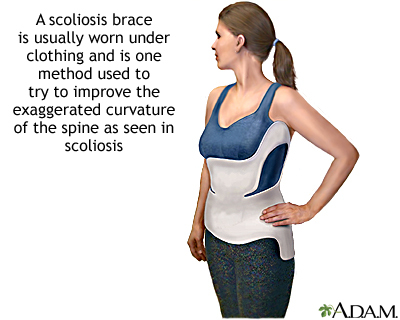 One type of treatment for scoliosis is the use of a brace. The brace works by exerting pressure on the back and ribs to push the spine in a straighter position. The brace usually fits snugly around the torso and can come in many styles. In a child who is still growing, bracing is usually recommended to help slow the progression of the curve. The brace is usually worn full-time until the growth of the bones has stopped.